With the blessings of Madhuri Sakhi Samedha Sri Premika Varadhan, Sri Swamiji established Sri Sandeepani Gurukulam , named after Bhagavan Sri Krishna’s Guru, on 12thJune 1995, the 101st Jayanthi Mahotsav of Kanchi Sri Chandrashekarendra Saraswathi Swami who dedicated His life to propagation of Vedic Dharma. 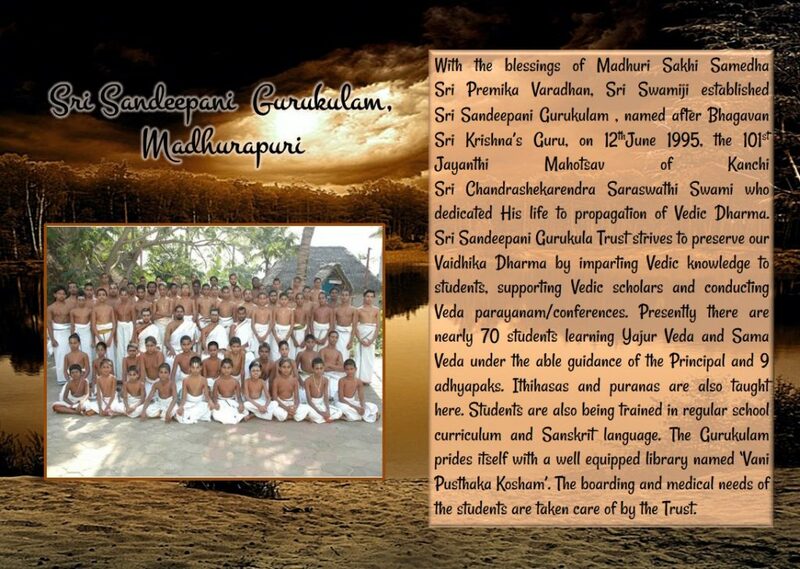 Sri Sandeepani Gurukula Trust strives to preserve our Vaidhika Dharma by imparting Vedic knowledge to students, supporting Vedic scholars and conducting Veda parayanam/conferences. 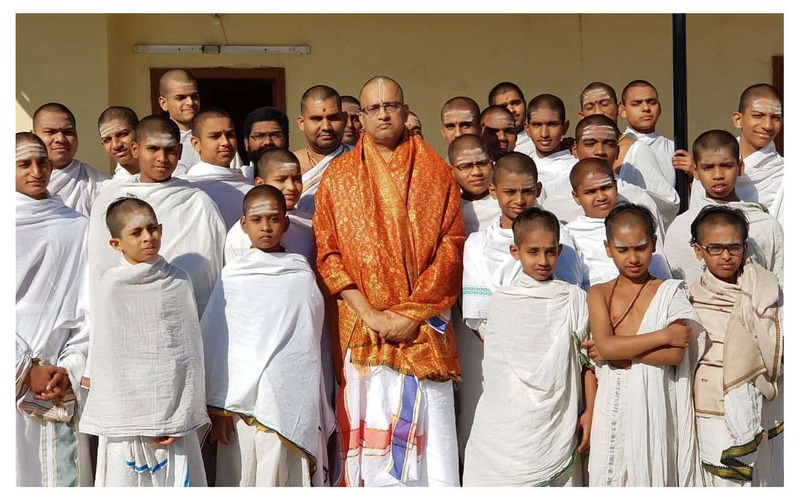 Presently there are nearly 70 students learning Yajur Veda and Sama Veda under the able guidance of the Principal and 9 adhyapaks. Ithihasas and puranas are also taught here. Students are also being trained in regular school curriculum and Sanskrit language. The Gurukulam prides itself with a well-equipped library named ‘Vani Pusthaka Kosham’. The boarding and medical needs of the students are taken care of by the Trust. Patasala at Srirangam was established on 17th April 2006, near the Thaayar Sannadhi, in a bid to fulfill Sri Swamiji’s long cherished wish to offer Veda Parayan to Sri Ranganatha Swami. Yajur Veda and Rig Veda are taught here. There are 31 vidyarthis pursuing their Vedic studies under the guidance of 2 adhyapaks. 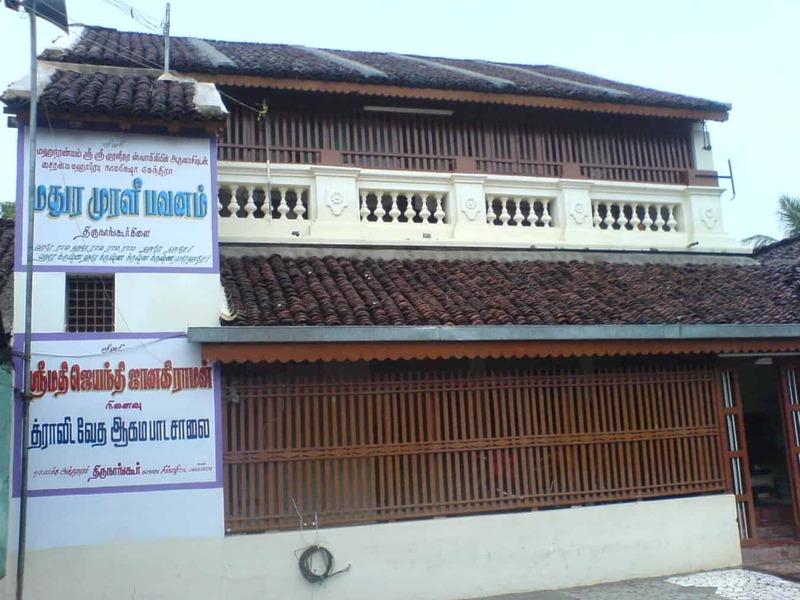 This patasala near Sirgazhi was established on 26th October, 2001, and later named after Late Smt Jayanthi Janakiraman, an ardent devotee of Sri Swamiji. This holy kshetra hosts the famous 11 Garuda Seva and has been sancitified by the incarnation of Thirumangai Azhwar. The patasala trains its students to become Vaishnava priests adept in Vaishnava agama shastra, Divya Prabandhams and Vedas. The course tenure is 6 years. As of now 20 students are pursuing the course under the guidance of 3 adhyapaks. They are also trained in regular school curriculum. There is an exclusive library with unique books on Vaishnava Sampradaya. With this patasala as the centre, under Sri Swamiji’s guidance support is extended to the renovation and maintenance of all the surrounding divya desams. Sri Sandeepani Gurukula Seva Trust established in 15th September 2005, runs a Yajur Veda Patasala in Hyderabad, AP. There are 27 vidyarthis pursuing their Vedic studies under the guidance of efficient adhyapaks. Sri Veda Vyasa Purana Patasala is run at the Sri Sundara Anjaneya Swami Temple at Bengaluru. This patasala is dedicated to the teaching of our puranas, itihasas and bhakti granthas. Shuddha Premika Vidya Kendra is dedicated to imparting knowledge on the innumerable granthas and kavyas of Paranur Mahatma Sri Sri Krishna Premi Maharaj.